With so many possible areas to cover I’ll stick to the key areas that relate to MB and if anyone has any specific questions you can tag me on the Team Profit Facebook page. Looking at a racecard can be confusing with all those numbers and abbreviations. I’m going to try and help explain what it all means. Example (taken from Racing Post) of a basic racecard. Circled in RED – the race distance. Races are run over a minimum distance of 5 furlongs. A furlong is 1/8th of a mile. To confuse you further races will either be referred to in furlongs or in miles, so one person might call the Derby a 12 furlong race and another might call it a mile and a half! Circled in BLUE – the Class of race indicates the quality of the race (the lower the number the better the race). The (2yo) tells you the age of the horses the race is open to. Circled in GREEN – the 3 numbers indicate the Race number, the Draw and the horse’s form. In this instance the horse is allocated the number 1 (in races of this type where all horses carry the same weight, horses are listed in alphabetical order). The “23” is the horse’s previous form. In this case it tells us that the horse has run twice before, finishing 2nd and 3rd. If there are no numbers (as with horse 2, 3 and 5) it means this is the horse’s first race. If the number is in bold type (as with the “8” under horse 4) it means the race took place on one of the all-weather tracks (ie not run on grass). If you see a horse with “0” in its form it means they finished 10th or worse. 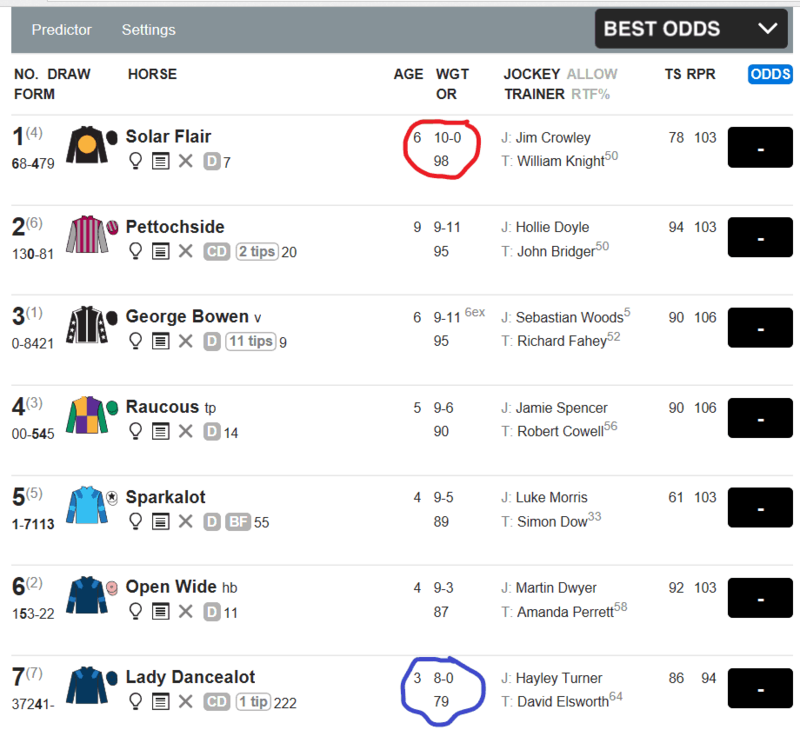 Circled in YELLOW – this shows the horse’s age and the weight that the horse is carrying (in this case all the horse’s in the race are 2 years old and carrying 9st2lb each – this is referred to as “level weights”). Circled in PURPLE – sometimes you will see what look like random letters next to a horse’s name. 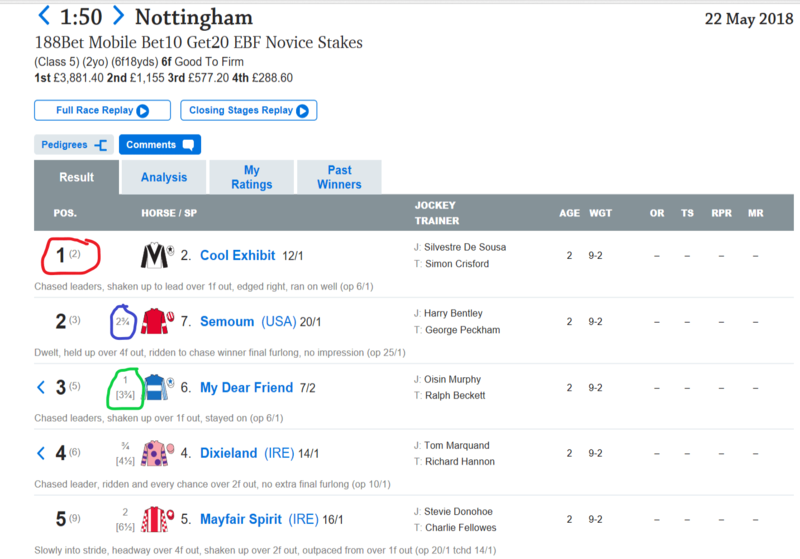 In the two cases circled the “BF” stands for Beaten Favourite, meaning that the horse has previously been favourite for a race but failed to win. “D” which means the horse has won over the distance in the past. The numbers next to this show the number of days since the horse last ran. So, horse 4 last ran 17 days ago and horse 6 22 days ago. Circled in RED – the main number is the finishing position and the smaller number in brackets is the stall the horse came from. Circled in GREEN – for horses that finished 3rd or more you will see two figures. The first is the distance between the horse and the one in front of it, the second (shown in “[ ]”) is the cumulative distance behind the winner. In this instance the 3rd horse finished 1 length behind the second horse and 3.75 lengths behind the winner. That’s probably as much as you need to know purely from a MB point of view, but if you are interested in knowing a bit more, read on! Group Races (classified as Group 1, 2 or 3) – these are the best type of race and usually the most valuable. It is the pinnacle of a horse’s career to win a Group 1 race. Races are also segregated by Class. All Group races are also referred to as Class 1, but the other types of race can be split into Class 2, 3, 4, 5 or 6. The Class of the race dictates the value, with Class 2 races being the most valuable. So it is more prestigious to win a Class 2 Handicap than it is to win a Class 6 Handicap. All horses are allotted an official rating (also known as a Handicap Mark) once they have run 3 times. This is then reviewed after each run during the season and adjusted up or down depending on the horse’s results. The higher the number, the better the horse. Any horse rated 100+ is usually capable of winning a Group race. The best racehorse of recent years, Frankel, had an official handicap mark of 140. The handicap mark provides a guide as to how much weight a horse should carry in a race when competing against other horses with the rating equal to lbs in weight. Handicap races are usually open to horses within a certain rating band. 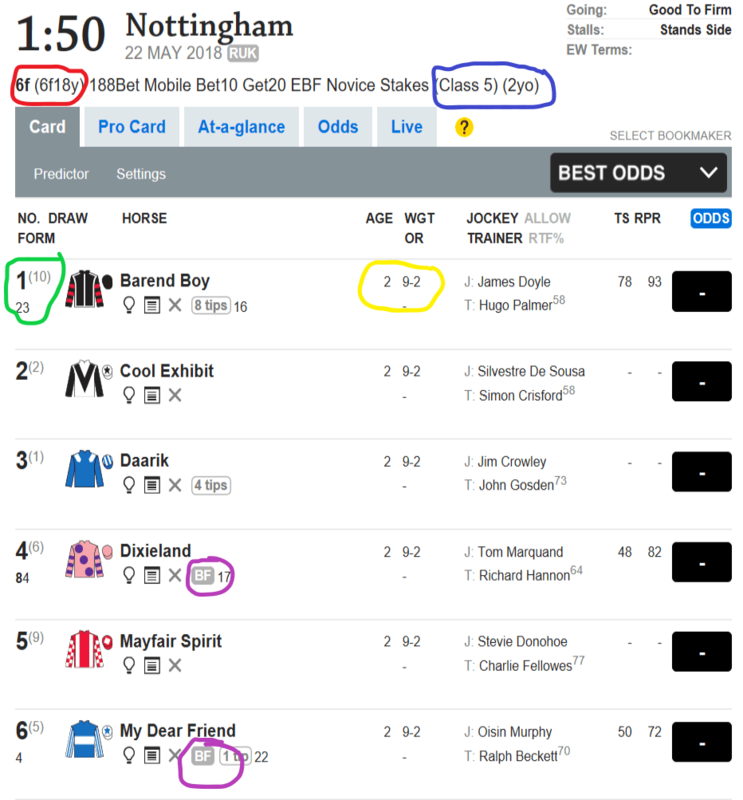 Looking at the example below, the circled information tells us the race is a 6 furlong Class 2 Handicap open to horses aged 3 or more and rated between 0 and 105. Horse number 1 is 6 years old, carrying a weight of 10st 0lb and has an official rating (OR) of 98. Horse number 7 (the bottom weight) is 3 years old, carrying 8st 0lb and has an official rating of 79. The top-rated horse is always referred to as “giving weight” to the other runners, in this case Solar Flair is “giving 2st” to Lady Dancealot. The aim in a Handicap is that all the horses should cross the finish line together – hence the better horses having to carry more weight. Within all races there are weight allowances that can be used to the trainer’s advantage. The rating is the starting point for the weight the horse will carry. If the horse is entitled to use an allowance (for example 3 year olds will get a weight allowance when running against older horses, fillies/mares will always get an allowance when running against colts, etc). The maximum weight a 4 year old or older can carry in this race is 10st, and the maximum weight a 3 year old can carry is 9st 5lb. Added to this 3 year olds “get” 9lbs from the 4 year olds and up. So this tells us that in reality, based on ability and straight ratings, Lady Dancealot should actually be carrying 8st 9lbs. I hope that this has helped some of you, but if there is anything else you want to know more about then give me a shout!